Employeesmay noticemissing scheduled hours as displayed on the HR Direct Timesheet page for Salaried Employees (Exception Reporters). We have reviewed this with our UITS resources and they have confirmed there is software bug in how this is displayed, BUT this will not have any impact on your payroll calculation. No action needed. In any week that includes a holiday, the timesheet won’t display the scheduled hours for all scheduled days that follow the holiday. So, for example, if the holiday falls on a Monday, pretty much the whole week doesn’t display. If it falls on a Wednesday then scheduled days after Wednesday won’t display the scheduled hours. 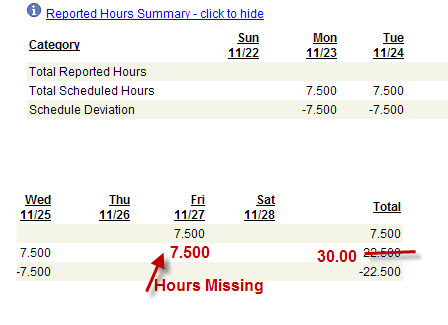 Below is an example of what is displayed on the Timesheet view for a full-time 37.5 hour employee this week. Note the missing scheduled hours on Friday. Also the total for the week isn’t correct. Again, no action needed. This display of hours is informational only and there is no adverse impact on payroll. It is a known Oracle issue and will be fixed in a future patch from them.